Cabinets aren't so easy to replace, and doing so can be incredibly expensive and time-consuming. So, if your cabinets need a little bit of tender loving care, why not check out our cabinet hinges and hardware? Our cabinet hardware and hinges will do wonders for your old cabinets. In fact, once your new hardware is installed, you'll hardly recognize the cabinets yourself! Here are some of the hardware options we supply. 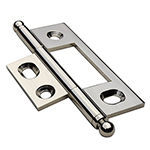 Standard Hinges – If you're looking to replace standard cabinet hinges, then you've come to the right place. Here at Horton Brasses, we supply cabinet hinges in brass, nickel, and hand-forged iron. With so many finishes available, you'll easily find the perfect match for your cabinets. Plus, all of our hinges are made strong with age-old techniques to guarantee longevity. 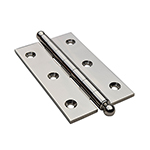 Non-Mortised Hinges – For those who are looking for an easy to install, non-wood-damaging hinge, we have plenty of non-mortised hinges for sale. The non-mortised hinge comes in a wide variety of styles and colors in order to satisfy a growing demand. Because our customers have asked for more and more outstanding non-mortised hinges, we can confidently say our non-mortised hinges are the best on the market today! Knobs and Pulls – We realize that your cabinets may be in need of more than just hinges. 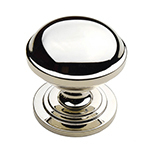 Here at Horton Brasses, we also supply knobs and pulls. Our knobs and pulls can be ordered in many different styles and sizes, so whether you're looking for spice cabinets pulls or a knob for the kitchen door, we have you covered! Choose your knobs' finish from a huge variety in order to best match your new hardware to your existing cabinets! So, what are you waiting for? Update or fix those old cabinets with appropriate hardware! All of our cabinet hinges, pulls, knobs, latches, and locks are made to be both beautiful and strong, so you don't have to worry about replacements for many years to come.